The infamous WW II dive bomber flies as good as it looks! OUTSTANDING OVERALL FLIGHT CHARACTERISTICS FOR A WARBIRD. The O.S. FS-200s 4-stroke provides power for the Stuka. THE INVERTED GULL WINGS and ungainly looks makes the Stuka (short for Sturzkampfflugzeug or “dive bomber”) one of the most easily recognized Luftwaffe planes of WW II and also one of my favorites. Although outdated early in the War, it was effective in supporting the fast-moving ground troops and instrumental in the early successes of the Blitzkrieg style of warfare. Today’s modern precision bombers and ground attack aircraft, such as the A-10 owe their roots to the Stuka. The Stuka pilot would put his plane in a near vertical dive as he passed over the selected target and then, after he released the bomb load, the autopilot would automatically pull the plane out of the dive in case the pilot blacked out during the 6G pullout. 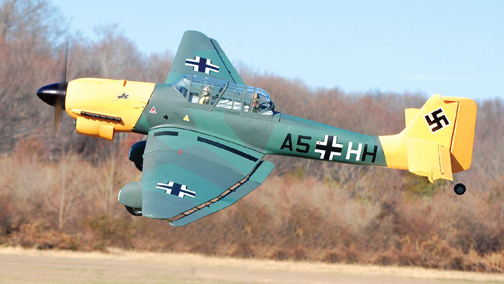 Distributed by VQ WARBIRDS (as of Sept 2015), ESM manufactures two Stuka variants, the “B” model reviewed here and the later version and more streamlined “D” or Dora model. They feature molded epoxy fiberglass fuselages, wing center section, wheel pants and an already painted cowl. The outer wing panels, stabilizer, rudder and control sur-faces are balsa and ply covered in an iron film and then factory painted. A complete hardware and accessory package including control linkages, pull-pull wire, engine mount, fuel tank wheels and nuts and bolts are included. A variety of scale details are also included such as dive brakes and a bomb. Although it is an ARF, the Stuka requires substantially more work to assemble than your average sport plane. The builder should have assembled a few ARFs or kits before tackling the Stuka. WING AREA: 936 sq. in. WING LOADING: 39.4 oz./sq. ft.
All of the sturdy high-quality fiberglass parts are very detailed with molded panel lines. The outer wing panels are fully sheeted on top with balsa and open bays underneath. Since the entire model is fac-tory painted in flat military colors, all the components match well and result in a very scale-like appearance. The fit of all the major components is excellent, with the fuselage-to-wing joint one of the best I’ve seen. The instructions are adequate to assemble the model, but there are errors and omissions. The experienced builder will spot these, but it does cause some head-scratching. For instance, a plywood template is included to drill wing alignment dowels for the wing panels, but these are not mentioned. Another area that could trip you up is hinging the elevators prior to installing the wire joiner. The large one-piece wing is assembled in three sections. Although not mentioned, I sanded the paint off the fiberglass center section prior to epoxying the panels together. 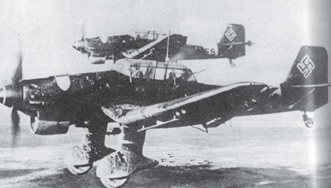 The unique Stuka under-slung flaps and ailerons are accurately duplicated on the model using special hinges. I found the easiest and most accurate method to install these was to glue the pin portion into the flap and ailerons and set them in place into the slots cut into the wing. I used a straightedge to make sure they all lined up and moved freely. The two flap sections are jointed by an internal wire. The flap and aileron servos are hidden inside wing hatches. I substituted Du-Bro 4-40 pushrods and linkages for the included hardware as I used a larger-than-recommended engine. I also used Du-Bro Heavy-Duty control horns and Hitec HS-645MG servos for all the flying surfaces for their high torque and durability. The Stuka drew a crowd and many admiring comments as I assembled it at the East Coast Swamp Flyers field. I balanced the model at the recommended CG without having to add any weight (a heavier engine helps here). A Graupner G-Sonic 16*12 3-blade prop proved to be a good match to the O.S. 200. The grass was short and the Stuka was easy to taxi but looked like it may be prone to nosing over (just like full-size one). I was a bit surprised about how much right rudder was required to keep the model going straight during the takeoff run and found I needed to add a little more rudder throw. The big O.S., combined with the extra mass of the 3-blade prop, most likely contributed to the left-turning tendency. Stability. I felt that the CG was too far aft and moving it forward helped increase the stability. At the recommended CG, the model is flyable but somewhat touchy, especially in pitch. At the forward CG, it exhibits near neutral stability. Flaps cause a slight pitch-up and increases low-speed stability. Tracking. The model tracks straight and requires a little rudder coordination during turns to make them look better. Aerobatics. Basic aerobatics are not problem for the model. While not scale, rolls look cool when you raise the nose and let the model arc through it. The roll is fairly axial and moderately fast. Low passes look very realistic and the TurboHeader muffler provides a deep sound that sounds like a full-size plane. Glide and stall performance. Despite the large amount of drag on the model it glides quite well. I ran out of fuel and the resulting dead-stick was easy to manage as long as the speed is kept up. The plane falls off on a wing during a stall but is easy to recover. The overall flight characteristics of the JU-87 are outstanding for a warbird. Hard turns and sharp pull-ups (within reason) show no sign of tip-stalling. Even though my model came out quite a bit heavier than the specifications, it flew like it was much lighter. This is not to say this is a beginner’s model as it has a relatively high wing loading (compared to a typical sport model), but it’s a good introduction to warbirds for the intermediate pilot. I am extremely pleased with the ESM Stuka and look forward to many more bomb runs with it. Flap and aileron linkage are easy to get to for making fine adjustments. The quality and craftsmanship throughout the Stuka’s construction is first rate. Soviet flak exploded among the German Junkers Ju 87 Stuka dive-bombers as the formation pressed toward its target: the Baltic Sea harbor at Kronstadt. They were still 10 miles away from it when Soviet Yak fighters dived through their formation. Within minutes, the clear blue September sky was filled with smoke, flak bursts and burning Soviet and German aircraft. Undaunted by the chaos that surrounded him, Hans-Ulrich Rudel flew his Stuka straight and level. He could already see the Soviet battleship Marat anchored in the harbor. It was a primary target-one that had to be destroyed at all costs-and Rudel was determined to sink it. In increasingly dense flak, as he closed on the ship, he was certain of his imminent destruction. Finally, about two miles short of his target, he pushed the stick forward to drop the Stuka’s nose toward the ocean 9,000 feet below. Within seconds, he was in a screaming, high-speed, 70-degree dive with the 2,000-pound bomb under the nose pointing directly at the center of his target. As the Stuka nosed over, the Marat and the other Soviet ships in the harbor added their flak to the surrounding cacophony of death. Heavy flak buffeted the Stuka as it dropped, and Rudel knew that he could not deploy his dive brakes. If he slowed, flak would quickly destroy his aircraft. Plummeting downward, he held the aircraft steady until the ship filled his windscreen, then at 90 feet, he pushed the bomb release and struggled to regain control. Slowly, almost imperceptibly, the Stuka came out of its dive and skimmed across the water. Behind him, Rudel saw the battleship go up in fire and smoke. The Marat was finished; the bomb had crashed through several decks and exploded in the magazine. Rudel survived this mission and went on to become the Luftwaffe’s top Stuka pilot. The attack that day in 1941 proved that the single-engine Stuka could inflict damage out of all proportion to its size, and it added another achievement to its impressive wartime record. This excerpt originally appeared in the article “Screamin’ Demon,” which appeared in the June 1999 issue of Flight Journal. I spent about 30 hours assembling the Stuka, and the results are well worth the effort. Once the wheels left the field, I quickly forgot about the issues with the instructions. Now that the test flights are completed, I plan on adding a few more details and some weathering but I also don’t want to add much more weight.